Enjoy a Civil War living history demonstration by the Fairfax Rifles infantry group at the Graffiti House in Brandy Station, 19484 Brandy Road , Brandy Station, VA. The event, including a tour of the historic house, is free. The Fairfax Rifles (left) are setting up camp at the Graffiti House on the 144th Anniversary of the Battle of Brandy Station. On Saturday and Sunday, June 9th – 10th, between 11AM and 4PM, the 17th Virginia Infantry Regiment, Company D will demonstrate the lifestyle of the Confederate soldier who fought in the Civil War. Throughout the weekend, skilled re-enactors from the Fairfax Rifles will demonstrate how the typical soldier in the Army of Northern Virginia was uniformed and equipped. Educational programs will feature drill demonstrations, musket firings and talks about field cooking and the camp life of a Southern soldier on campaign. 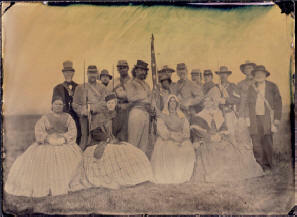 Their ladies, dressed in authentic costume will accompany the Fairfax Rifles. The Battle of Brandy Station is also known as the Battle for Fleetwood Hill. In the early hours of June 9, 1863, more than 10,000 Union troops silently crossed the Rappahannock River and set in motion the Civil War’s largest and most hotly fought cavalry contest. By nightfall, the 9,500 Confederate horsemen, under the command of J.E.B. Stuart, had paid a heavy price for a narrow triumph. Free tours of the historic Graffiti House will be conducted all day. The plaster walls on the second floor of the house are covered with an outstanding and unique collection of charcoal and pencil graffiti left by soldiers from both armies. .